Buckland Museum of Witchcraft & Magick in Cleveland – Zero Equals Two! 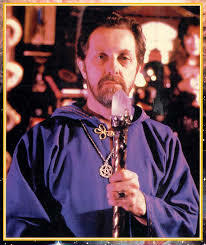 The late Raymond Buckland was, of course, one of the founding fathers of the Modern Wiccan Revival. Having corresponded with Gerald Gardner, he became Gardner’s spokesperson in the United States. Eventually, he and his wife Rosemary eventually took initiation at the hands of a Gardnerian High Priestess, Lady Olwen. Having moved to Bayshore NY they founded a coven. After some time he would found his own Wiccan tradition, the Seax-Wica, based on Anglo-Saxon Pagan symbolism. “Raymond Buckland started The Buckland Museum of Witchcraft and Magick in 1966. After visiting the late Gerald Gardner and his collection on the Isle of Man, Raymond was inspired to start a collection of his own. While working for British Airways, he was able to acquire many of the artifacts in this collection from all around the world. He initially displayed his museum on a few shelves in the basement of his Long Island, N.Y. home. However, over time, Raymond’s witchcraft collection rapidly grew to well over 500 artifacts, ranging from Ancient Egyptian ushabti’s to documented artifacts from the Salem Witch trials. This was the first museum of its kind in the United States with an anthropological approach to the world of folklore and the supernatural. “The museum was in existence for ten years in this New York location (1966-1976). During that time, it was featured in numerous magazine and newspaper articles and was the subject of a television documentary. The New York Times, New York Post, Newsday, Look Magazine, Cosmopolitan, Esquire, Scholastic Voice, and many more, including foreign magazines, had featured articles about the museum. Raymond was also interviewed on a large number of radio stations and both national and international television. The Metropolitan Museum of Art requested and featured some of the pieces in one of its special exhibits. “In 1976, Raymond Buckland moved to New Hampshire where he opened the museum from 1977 to 1980. Unfortunately, because of a rigorous writing and lecture schedule, he then had to place the museum collection into storage, where it remained for a number of years. “The museum collection was briefly reestablished in New Orleans in 1999 where it passed through multiple hands before being salvaged by Rev. Velvet Reith. A bit damaged and somewhat reduced collection, Velvet was instrumental in preventing the collection from degrading further and being lost. Here’s an online gallery of videos featuring Buckland: http://bucklandmuseum.org/photo-gallery/video-gallery/. And a sizzle reel posted on their FB page: https://www.facebook.com/WitchMuseum/videos/296934507506214/. As Rich Kaczynski noted – you can see a set of Lady Frieda Harris’ Co-Masonic tracing boards in the background!